Posted March 15, 2018 by Bailey Heard & filed under Blog, FeaturedOnHomePage. Last week was a really difficult week for my family. My aunt (my dad’s older sister), Betsy, passed away from complications with COPD. She’d been battling COPD for years and, after this last hospital stay, her lungs could no longer take the stress. I’m thankful I was able to be by her side during her final moments on this earth, even though it broke my heart and brought back some really traumatic moments in my life. I wouldn’t have it any other way because it was an honor to be one of the many friends and family members surrounding her with love that day as she passed from this life to the next. 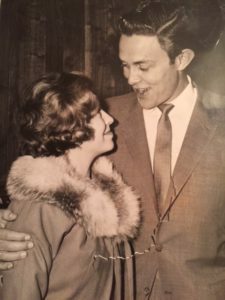 I had the privilege to speak at her funeral this weekend, but I didn’t get to say everything I wanted to, so today’s post is my tribute to my Aunt Betsy. There are not many childhood memories of my family getting together that don’t involve my aunt. What I remember most is how she would greet each one of us, male or female, with a great big kiss on the lips and a big bear hug. I believe her favorite holiday was Christmas, because I remember the presents were piled as high as the Christmas tree at our family Christmas Eve parties. 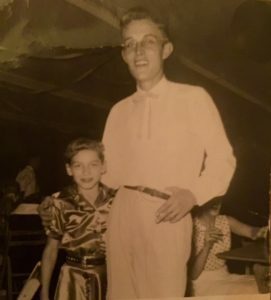 When I was a teenager she’d always ask me to sing, “All I want for Christmas is You,” by Vince Vance and the Valiants at our family Christmas parties because she remembered when I sang that song with Vince Vance at my dad’s night club, The Texas Star, and at the Denton County Fair, as a kid. I secretly loved how she encouraged my passion to entertain. I always felt like she understood me and appreciated who God made me to be. I never forgot how she made me feel like I was important, talented, and had something special to offer the world. I think the reason she made me feel so understood was because she was a born entertainer. As a child she sang on shows with Johnny Cash, Roy Clark, Elvis & Patsy Cline with the name Little Betsy Kiss. When she was 21, she won a contest on KBOX radio (deeming her the KBOX Queen) to reunite with Jimmy Dean, whom she’d performed with as a kid. Of course, I never knew any of this until I interviewed her daughter, my Cousin Lisa, for this blog post. 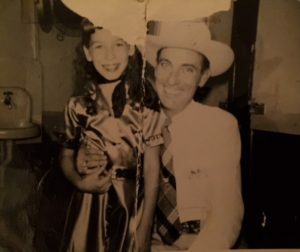 What I do remember was spending many weekends in Wylie, Texas, at the Wylie Opry with my Aunt Betsy, Uncle John, and my Grandmother, Nanny, watching my Cousin Lisa sing and perform. I was mesmerized watching Lisa on stage and I especially loved feeling like a VIP guest when she brought me backstage at intermission to meet the other singers. My aunt and uncle were the king and queen of the place, always working the concessions and talking up all the people. It was a magical place to spend my childhood and I’ll never forget getting to perform on stage with the live band singing, “Down to My Last Tear Drop,” by Tanya Tucker when I was about 10. My aunt always encouraged my desire to entertain and, after interviewing my cousin about her mom’s life, I understand why. I wish I would’ve asked my aunt so many more questions. Why do we often wait until someone is gone to learn more about their lives? My Aunt Betsy would always tell me she and I were so much alike. I never really knew what she meant by that. I thought she was comparing us because we were both afraid to drive, she was afraid to fly, and I always assumed it was because we were both fearful and cautious people. Now I see that maybe she meant we were both sensitive artists and cared deeply for people, both of us placing making others happy as our highest priority. Betsy loved others well until the very end. Her friends became her family and her love for her husband, John, her daughter, Lisa, and her family and friends became her legacy. She was the glue that brought our family together. Her life and her legacy inspire me to do the things I’m afraid of, to immediately take steps in the direction of my interests, passions, and dreams, and to make others feel the way she made me feel: understood, seen, and important. We all miss her, love her, and she’ll be in our hearts forever. Truly appreciate your prayers for my family during this time, especially your prayers for Betsy’s husband, John, of 55 years and her daughter, Lisa. As well as for my dad, Jim, and my Uncle Brad. So grateful for your love and support. Blessings. PS – My Aunt Betsy’s obituary can be found here. What a BEAUTIFUL tribute to a wonderful lady. She loved her family so very much. I am so blessed to have had her as a cousin. Thank you so much for reading, encouraging and sharing! She most certainly did and she loved you dearly!! Looking forward to seeing you at the family reunion in a few months! Wonderful tribute! God bless all the family. Thank you so much Janet!! I appreciate you reading and leaving a comment. Blessings to you!